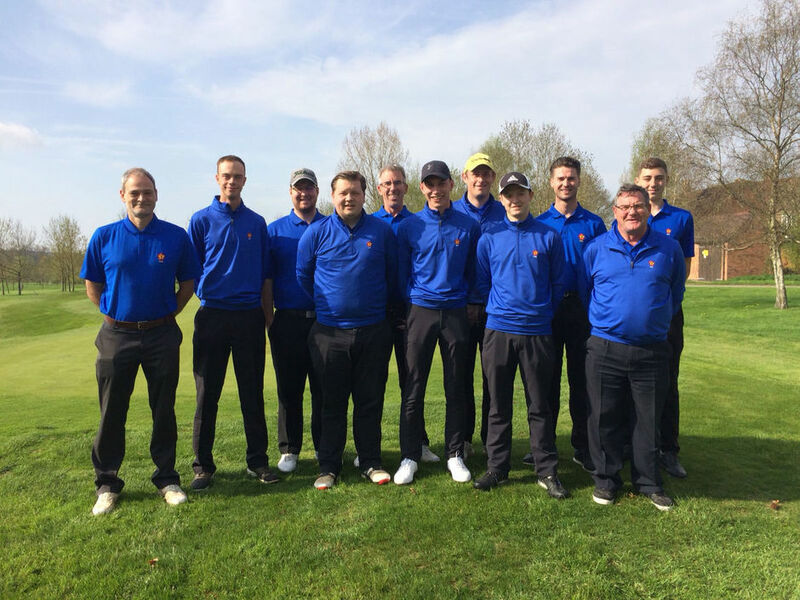 The first friendly of the season took us to The Henley GC near Stratford with some new faces on show and some experienced players making their return. Chris Savage and Taylor Sargeant started proceedings taking on Paul Walker and Gary Greenway. The game was a bit of a rollercoaster with the Northants pair coming back from 2 and 3 down on a couple of occasions before they finally succumbed to a birdie on the par 5 18th. The second pairing saw Overstone pair Jack Binch and Ryan Genner playing against Chris Staite and Karl Mason. The game finished in the same way that it started with both pairs making a bit of a mess of a par 5, but after a glorious wedge shot into green by Ryan, Jack had the opportunity to win the game with a 4ft putt up the hill. Sadly Jack just left it short and the game was halved. Obviously, all the team watching from around the green were very sympathetic to the attempt, but both pairs felt like a half was probably a fair result. Match three saw debutant David Gottsch paired with Jack Hall against Dan Launchbury and Ben Goodison. The Northants pair started slowly with some troubles on the first hole and were playing catch up most of the way round, eventually going down 4&3. Match four saw another debutant in the shape of 15 year old Owen Watts paired with the captain despite his best efforts to be non-playing for the match in a game against Dan Pearce and Mark Davies. Owen drove the ball brilliantly and showed no signs of nerves at all, and when combined with the captain’s putter working quite well it was very difficult to match for Warwickshire and the Northants pair won quite easily 5&4. Match five saw the reintroduction of the James Barker and Richard Dalton partnership to county golf who were paired against the even more experienced Nev Gardner and youngster Josh Davenport. The Northants pair showed once again what a deadly combination they are in foursomes and showed some remarkable short game skills around the green. Perhaps the pick of the bunch being on the 16th where they got up and down from behind the green where only half of the flag could be seen due to the severe drop off on the back. The Warwickshire pair were in a similar position but could not repeat the Northants magic so lost the hole and the match 3&2. Taylor Sargeant got us underway in the afternoon against one of his morning opponents Paul Walker. The game was a lot closer than the score line of 5&3 to Warwickshire suggested. Due credit to Taylor for volunteering to go out top in both matches, especially in a game against a strong county, as you are always going to be up against it. Chris Savage took on his morning opponent Gary Greenway and was in control of the game all the way round the course. Every time we received a score check Chris was winning 2up, but never take anything for granted in this game as his opponent won the last 4 holes in a row to win 2up himself. A turning point in that game and it started to seem that way in the match too. David Gottsch played Dan Launchbury again and had a much closer match than the morning, again this match went all the way to 18 with Northants ahead, only for Warwickshire to birdie it and square the match. Gottsch deserved more, Northants deserved more, but the pattern was beginning to set in. Ryan Genner played Chris Staite and managed to be the only undefeated player in the Northants team for the day. He played a very similar wedge into 18 as he had in the morning, but this time was able to convert the birdie putt to win the hole and square the match. Jack Binch had the pleasure of Dan Pearce’s company in the afternoon. In a good game Dan’s metronomic driving really played to his advantage on a long course with very thick wet rough. Other than that there was not a lot in it but Warwickshire won 3&2. Jack Hall played against Ben Goodison again and was again on the losing end, going down 5&3. Just one or two crooked shots just at least opportune moment let Jack down. Owen Watts played against Warwickshire’s longest hitter Josh Davenport and from behind it looked like a fantastic game. Josh managed to reach the long par 5 first in 2 (the only player to do so on the day), but un-phased Owen made a birdie of his own and halved the hole. The pair traded blows all the way round the course with Warwickshire eventually prevailing 2&1. This was a very impressive debut for the 15 year old Owen and he is definitely one to watch out for in the future. Attempted non-playing Chris White thought he had got a great draw against Karl Mason who was starting to feel really under the weather after the morning round, but again, never take anything for granted. Chris’ putter that had been so good in the morning went colder than the dark side of the moon in the afternoon and combined with the genuine stupidity of hitting the wrong ball when playing the 15th hole 3 down, lost 4&3. Richard Dalton played Mark Davies who massively improved from the morning. He seemed to be driving long and straight and putting well, the perfect storm on a long and challenging golf course. Mark ran out a 5&4 winner but not for the first time on the day the score line was probably a bit harsh. Last man on the golf course James Barker played Nev Gardner. They won’t thank me for saying but the combined age of this group was 105 years old, but like a fine wine these two seem to have got better with age. Nev holed 2 pitch shots and rolled in another couple of birdies and found himself 4up around the turn but James was playing well and never gives up, something we can all learn from. By the time they reached the 15th James had got it back to 2 down, made another great up and down and all of a sudden was back to 1. The pair halved the 16th in routine pars, despite James’ opponent bemoaning his putter. James won 17 with another world up and down after an adrenaline filled 200 yard 7 iron went through the back, suddenly it was all square playing the last. 18 probably summed up our day, James hit 2 perfect shots to lay up to the long par 5 while Nev found tree trouble. Nev managed to find the back of the green and leave himself a twisty horrible putt for birdie which he of course duly holed. Disappointment for James having fought back so well and disappointment for the team, losing the singles 9-1; golf is hard!